Poor Ransom Riggs! He must be on pins and needles waiting for word on the adaptation of his Miss Peregrine's Home for Peculiar Children . The author/artist/director told MTV's Hollywood Crush that if he had his druthers, a director like Tim Burton would be a great choice to adapt his book. And then, according to deadline.com, Riggs' wishes were set to be granted with Tim Burton is in talks with Twentieth Century Fox to direct. Seems like the perfect choice, yes? 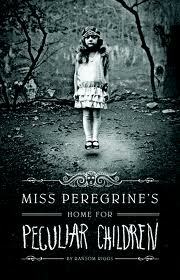 From the Hollywood Crush interview..
Twentieth Century Fox won the bidding war for movie rights to "Miss Peregrine." What's going on with the adaptation so far? I don't know. I'm just a book-writer guy. But you're also a filmmaker! In this particular case, I'm not writing the screenplay, so... They have a very clear idea [that] they want to get a big filmmaker in to drive the project because a lot of books get optioned, and a minority of those books actually get made. So if, I don't know, Tim Burton wanted to do it, I would be like, "That's great!" And that would give the book such a better chance of getting made! I think he'd do a fantastic job. Do you have any other suggestions for the movie? I think Tilda Swinton would make a very interesting Miss Peregrine. She's sort of elegant and birdlike. 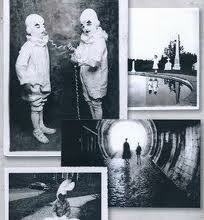 Ransom Riggs' inspiration was in part his collection of old photographs, many of which are sprinkled throughout the book. Here's how Riggs describes his story. "A mysterious island. An abandoned orphanage. And a strange collection of very curious photographs. It all waits to be discovered in Miss Peregrine’s Home for Peculiar Children, an unforgettable novel that mixes fiction and photography in a thrilling reading experience. As our story opens, a horrific family tragedy sets sixteen-year-old Jacob journeying to a remote island off the coast of Wales, where he discovers the crumbling ruins of Miss Peregrine’s Home for Peculiar Children. As Jacob explores its abandoned bedrooms and hallways, it becomes clear that the children who once lived here—one of whom was his own grandfather—were more than just peculiar. They may have been dangerous. They may have been quarantined on a desolate island for good reason. And somehow—impossible though it seems—they may still be alive.